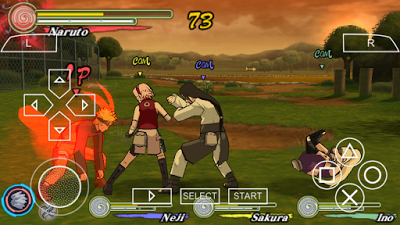 Naruto is one of the best Japanese anime and the movie drive has made may fans want to play the game on Android. I must say, finding a good Naruto game with good graphics and game play including effects was no piece of cake. Ultimate Ninja Heroes 3 apk answered the questions of where and how to download Naruto game on Android. Even though the game takes place on a 2D plane, the amazing teleportation skills makes it epic. Teleport background and foreground to defeat your opponent in combat. Ultimate Ninja Heroes 3 Narut provides varieties of characters from the movie with their abilities. Fight using your preferred characters to win the battle and get rewarded. Apart from the usual controls, jumps and wall runs, other attacks can be initiated by hitting the circle button. Employ special moves by tapping the Triangle button and then the circle button. The Master Road is presented as a series of squares along which you move cute little animated Narut. Unlock new characters with unique abilities as you progress. Unlock new ninja techniques and skills as you complete tasks. Earn points after a job well done. Purchase movies, music and character artworks with your earned points. Missions take on one of two formats. Defeat opponent(s) to continue to advance to the next stage. Button mashing is the order of the day in the fights here. Learn new skills and test them on weak opponents first. Perform combos the more you hit your opponents.